Both subgrade and subbase shall be constructed according to design requirement so as to offer the expected performance. They must be well drained, dry at the time of concrete placement, and provide uniform support for the weight of the slab and anything placed on the slab. If a floor slab is constructed on unstable subgrade or subbase, then the concrete placed may get wasted during construction and concrete slab is highly likely to suffer from settlement after construction. Therefore, substantial cautions shall be practised while subgrade and subbase are placed. The subgrade is considerably significant for concrete slab since concrete slab load and imposed loads are supported by subgrade. 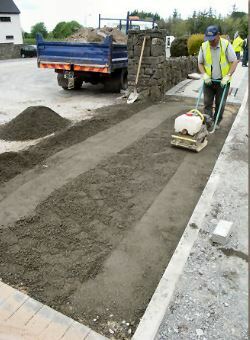 When required, Concrete slab can be placed on the top of natural soil without the need for extra layers provided that it is clean and compactable. In this case, the only problem would be the improper drainage of the soil. If the soil is wet due to rain or any other reason, then it cannot be compacted and flatted properly and suitable grade cannot be obtained. The project site is excavated to remove hills and fill pits and then compact the entire area so as to prepare the subgrade for loads of subbase and concrete floor. The degree of work required to prepare the subgrade is controlled by different types of soils namely: organic, granular, and cohesive soils. The organic soil is the least desirable because it cannot be consolidated and hence shall be removed from the site. Granular soil offers ultimate load carrying capacity and can be compacted easily. Cohesive soil does not provide bearing strength as much as granular soil. additionally, it may suffer from shrinkage and settlement and hardly compacted when it is wet. Finally, cohesive soil requires great effort to make it suitable for subgrade of concrete floor. Generally, a weight of 15cm thick concrete slab is around 3.6 KN/m2, and live load imposed on concrete, According to International Residential Code, ranges between 0.96KN/m2 and 2.9 KN/m2. 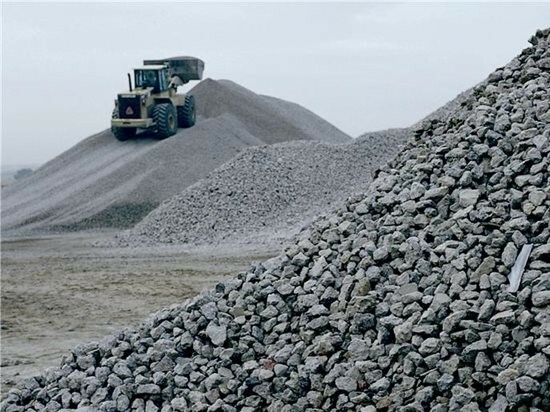 Consequently, the total load imposed on subgrade is around 6KN/m2. It is reported that, the allowable soil pressure for clean sandy soil is around 95KN/m2, and for weaker soil such as silt or soft clay is approximately 20KN/m2. 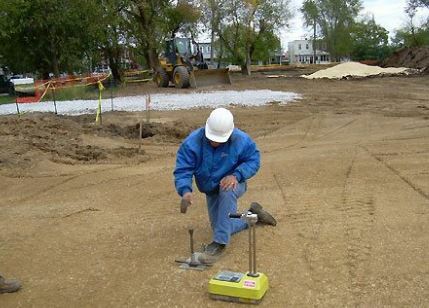 Therefore, it can be concluded that, the allowable soil pressure for concrete slab would not cause any problem. Nonetheless, the subgrade shall be uniform so as to avoid crack development in the slab due to bending. This may be achieved by recognizing cut and fill areas and compacting subgrade properly. Soil stabilization; Portland cement, calcium chloride, or lime blended into the soil then it is compacted. Excavated subgrade, mix it with gravel then apply compaction effort. Subbase is a layer of gravel, which is fairly cheap material, placed on top of subgrade. The subbase placement is optional and it serves as a work platform for construction of the slab and provide more uniform support for the slab. As the thickness of subbase increases, the ultimate load carrying capacity of slab increases. Therefore, the designer shall select thick subbase if the imposed load is large. Apart from carrying slab load, subbase interrupts capillary and prevent water to move upward from groundwater into the slab. For subgrade natural soil at project site or fill is brought to the construction site. For subbase, granular material is employed. It is possible that subbase and subgrade get saturated due to rains or freezing conditions before concreting is started. In that case subbase would turn into a soft layer which might not be suitable to support concrete. The suitability of subbase for supporting concrete is checked by proof rolling. It involves driving across over the subbase right before the beginning of concreting. If the tires sink more than 12.7mm, then the subbase needs improvement and shall be recompacted. Supervisor shall look for rutting or pumping during proof rolling. According to ACI 302.1, the former is when the surface of the subbase is wet, greater than three percentage points above optimum moisture content, whereas pumping is when the surface of the subbase is dry and the underlying soils are wet. Brought in materials if natural soil bearing capacity is poor. 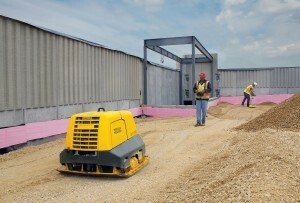 Gravel and sand compacts best with a drum roller or a vibrating plate compactor. Cohesive soil can best be compacted using a vibrating sheepsfoot roller or a rammer. For small projects, or around the edges, pipes, or columns, a plate compactor provides good compaction for sand or gravel. What are functions of subbase of concrete floor? Does it always necessary to brought infill material for subgrade construction? What the consequences of poor subgrade and subbase construction?